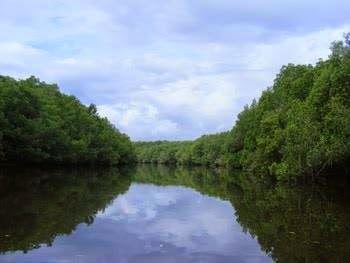 Bedul Mangrove area is located in the western end of the Alas Purwo National Park. Tourism activities are managed entirely by the villagers of Sumberasri, working closely with management Alas Purwo National Park. Development of Mangrove Bedul tourism aims to support regional conservation efforts, while improving economics of the villagers.A cooperation between the village of Sumberasri and Alas Purwo National Park, Mangrove Bedul Ecotourism (MBE) comprises a space of 2,300 hectares of intact mangrove forest with an adjoining lagoon of 18 km. Animals found in this region were monkeys, monitor lizards, birds, eagle (albatross ealang and Java), sea pigeons, birds blibis, herons, migrant birds from the continent of Australia, Ancel earth, king fisher, kecuk, pup-pup, and some as yet unidentified species. 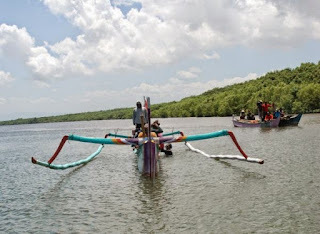 Also in The purpose of this mangrove tourism development is to enrich the mangrove forest resources in Block Bedul, by securing the area from destruction by both human and natural factors. Replanting the area in need of rehabilitation in Alas Purwo National Park. This activity also aims to improve the welfare of the community around the area. The original idea for the project was given by the community of the village of Sumberasri, in an attempt to restore and protect the mangrove area and all its existing flora and fauna. The project also serves as an alternative to develop the local economy and improve the welfare of the community by providing employment opportunities and a leisure space. So far, Mangrove Bedul Ecotourism is still solely managed by the tourism-board of the village of Sumberasri, making this project a genuine community-based tourism initiative, unique to Alas Purwo National Park. 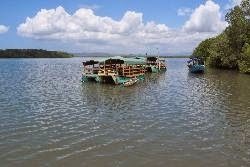 Mangrove Bedul Ecotourism offers three different tours to explore its mangrove and wildlife. On all three tours visitors are taken on traditional Javanese boats, the Gondang-Gandung. You can navigate immediately puppies with a traditional boat (Gondang-Gandung). While enjoying an intact mangrove forests and natural, seeing various species of birds, monitor lizards, monkeys as well as activities that seek masyarak shells, fishing and catch fish, some of the species who depend on the 26 different types of mangrove for their sustenance. In the future, the park intends to increase its package tours to include a variety of activities that give visitors a chance to see up-close village life and engage with the local community. The park also offers a pleasant location for those who wish to fish. The tranquil beach of Bedul is also easily accessible from the park, taking visitors through the lowland forest of Alas Purwo where deer, wild boar, peacocks and other wildlife can be spotted. An English-speaking guide will accompany guests on all tours, and lunch can also be provided if requested. For those who wish to enjoy this area for longer, a homestay in a traditional Javanese home can be arranged. Guests are taken by boat to the mouth of the river Kêre where some species of wildlife and mangrove can be observed. Visitors can finish their tour by crossing the lagoon and taking a walk through the lowland forest that leads to Bedul beach. Guests are taken by boat to the estuary of the lagoon where in the appropriate season, in addition to the wildlife that can be spotted all year round in the park, migrant birds from Australia can also be observed. 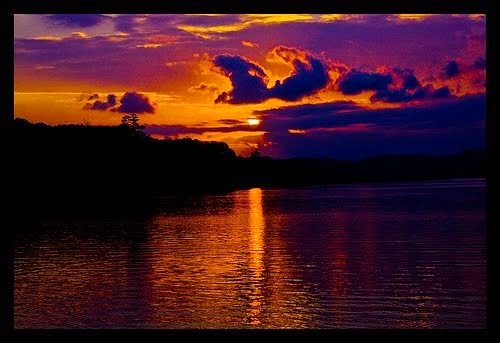 This location provides a beautiful view point for sunset. One attraction is the sunset Block Bedul Mangrove. Atmosphere of the sunset from the top we can enjoy a traditional boat on the right and left edges overgrown with various species of mangrove. In low tide, visitors can reach the beach of Bedul within an easy 15 minute walk. Alternatively, they can take the path through the lowland forest to reach the beach. Visitors take a 1 hour boat ride and a 30 minute walk through the lowland forest. No less interesting at the end of a trip down tropical rain forests we could see the turtle's Alas Purwo National Park on the shores of the ocean Indonesia to reach the turtle hatchery beach of Ngagelan, comprised within Alas Purwo National Park, where they will be able to see the newly born turtles and learn how they are kept and safeguarded until they are ready to be released into the sea. Option 1: From Banyuwangi take the bus to Srono Muncar, in Muncar change transportation to Tegaldlimo, in Tegaldlimo take a moto-taxi to Sumberasri village and from there follow the directions to Bedul. Option 2: Take a bus from Banyuwangi to Benculuk market. In Benculuk market take another public transport to Curahjati. In Curahjati hire a moto-taxi to Bedul. 0 Response to "Mangrove Bedul Ecotourism Alas Purwo National Park"